Almost everyone agrees we need to stop using fossil fuels. The October 2018 IPCC Special Report urges very rapid reductions in the use of coal and fossil gas, and in November 2018 the Director of the International Energy Agency, Fatih Birol, said, ‘We have no room to build anything that emits CO2 emissions’. Stopping ALL fossil fuel use might be hard, but stopping NEW fossil fuel projects is an easy first step. The federal government could ban new climate-damaging projects in Australia, but in the meantime, the primary responsibility for approving or rejecting applications for new fossil fuel extraction and infrastructure lies with state and territory governments. The South Australian state government can ban all new coal, oil, and gas projects within SA with almost no negative impacts. And other states and territories might then follow. It would be a legislative breakthrough if SA were to enshrine in legislation the principle that activities that cause avoidable greenhouse emissions can be banned purely on climate grounds. The No More Bad Investments (NMBI) model legislation, co-authored by Environmental Justice Australia and Philip Sutton, would do just that. It focuses entirely on banning NEW projects that would increase climate risk, not because that will be anywhere near sufficient to restore a safe climate, but because that is an easy first step that is possible immediately…and time is of the essence. SA no longer has any coal-fired power stations and has no current coal extraction, so banning new coal exploration, extraction, and infrastructure in SA would have no impact at all on state revenue and electricity security. However, a ban on new coal projects would prevent any further attempts to introduce Underground Coal Gasification (UCG). SA does not need UCG as a new source of gas for either electricity supply or the manufacture of fertilisers. A Port Lincoln demonstration plant is pioneering the manufacture of ‘green ammonia’ for use in fertiliser manufacture and as a medium for exporting renewable hydrogen. Petroleum exploration and drilling licences cover both oil and gas since they often co-exist, so both would be banned together. SA state revenue from exploration and production licences is minimal: ranging from a few thousand to $26,000/yr for exploration licences and from a few thousand to $116,000/yr for production licences. In 2016-17 SA received just $71.5 million in petroleum royalties from sales valued at $1.1 billion. Roughly 1/3 of that, around $24 million, was gas royalties. Those royalties would not be affected by bans on new oil and gas extraction, but if we assume that continued approval for new oil and gas extraction would increase production by 10%, then a ban on new extraction would mean SA coffers would only ‘miss out on’ an extra $7 million or so per year. Unfortunately the SA government cannot directly ban exploration or drilling in the Bight since offshore waters are under federal jurisdiction, but SA can ban any onshore support infrastructure that might be needed. The SA government can also lobby the federal government for a ban on oil and gas in the Bight and it would add ethical weight to that lobbying if we already had a ban on onshore oil and gas in SA. If Equinor receives federal approval, the chances are any oil it extracts from the Bight would be exported. No state royalties are payable on offshore production, and under current federal tax settings, Equinor would pay no Petroleum Resources Rent Tax (PRRT) for many years, if ever. Due to PRRT offsets they’d also not pay any income tax. Australia would receive no benefit but we would all suffer the increased climate risk from that oil being burned, and the brunt of any potential oil spill would be borne by SA. 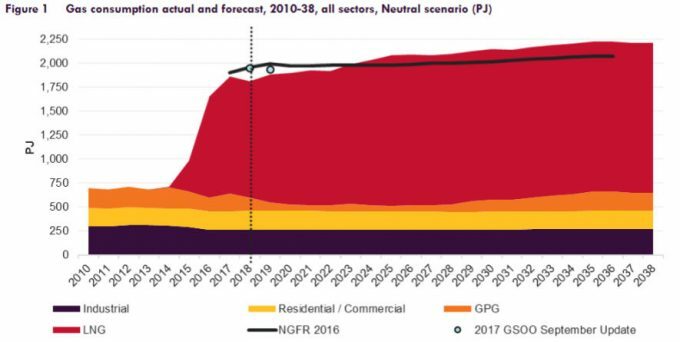 Fossil gas-fired power generation is indeed very useful for ‘filling in the gaps’ in wind and solar generation while SA transitions to 100% renewable electricity, but demand for gas is already falling and will fall even further as new solar, wind, and storage projects are completed. Already SA is at 58% renewable electricity and is predicted to be close to net 100% by 2025. We will continue to need a small amount of gas-fired generation even after that, but supply is guaranteed. A condition of the $48 million in state subsidies given in 2017 for new gas wells in the south-east and the Cooper Basin was that SA would have first call on that gas if we need it. In practice it is more likely that extra gas production will simply mean more gas exports. There is no gas shortage. The diminishing orange band in the Australian Electricity Market Operator (AEMO) chart below is gas-fired power generation (GPG) in AEMO regions (SA and the eastern states), and the red is LNG exports from AEMO regions. SA does not need any new gas wells to guarantee supply and we also don’t need any new gas-fired power stations. Currently SA always has a minimum amount (around 300MW) of gas-fired generation in its grid supply to provide ‘firming’ of wind and solar output but the capacity factor of SA’s gas-fired generators rarely exceeds 50% and most of the time it is much lower. One of the first objections that arise in response to calls for a ban on new fossil fuel projects is that coal and gas are essential for industrial processes such as the manufacture of fertilisers, steel, cement, and plastics. In practice any industrial heat processes can be performed more precisely and economically by renewable electricity, and non-carbon alternatives are available for many industrial processes that use chemical reactions involving coal or gas. Sanjeev Gupta has pioneered the manufacture of ‘Green Steel’ at his UK steelworks, using renewable electricity to recycle scrap metal feedstock, and he is now planning to do the same at his Whyalla steelworks. Conventional steel production requires coal, but steel can also be made without coal by using hydrogen (produced via electrolysis of water using renewable electricity) or sustainably produced biomass as the reductant. However, one of the key features of the model NMBI legislation is its flexibility. If a new industrial facility using coal or gas is proposed, it would be banned only if there is a carbon-free alternative available. In other cases new industrial facilities using coal or gas would still be permitted until a commercially viable non-carbon alternative becomes available. State-based bans on new fossil fuel projects would generally cost the state nothing beyond missing out on a small amount in royalties, but some R&D investment or subsidies would be very useful to assist the commercialisation of ‘green’ industrial processes. It’s understandable that many people still think ‘gas is better’. Not so long ago gas was cheap and old electric appliances were inefficient. Some people still compare gas use with coal-fired electricity even though SA no longer has any coal-fired electricity. Over the last 10 years gas prices have more than doubled and the efficiency of electric appliances has improved greatly. A 2018 Alternative Technology Association (ATA) analysis concludes that, “by choosing an all-electric home with solar PV, a new home buyer will be in the order of $9k to $18k better off over 10 years, as compared with establishing that home as dual fuel (i.e. electricity and gas) without solar”. For new home buyers, even without solar, the all-electric choice results in lower energy costs or only a minor difference either way (depending on where you live). According to another ATA report, all-electric households with efficient electric appliances and no solar also have lower greenhouse gas emissions than dual-fuel households, with the size of the advantage varying in accordance with the carbon intensity of local grid electricity. In SA, even all-electric houses without solar have much lower emissions than dual-fuel households now that we have 58% renewable electricity. All-electric households with solar can potentially already have net zero emissions, and by around 2025 even households without solar will have net zero emissions if they have all electric appliances. A ban on gas connections to new houses and buildings would prevent locking in avoidable emissions and also save money, particularly if owners also install solar PV. For existing houses and buildings, a ban on installing new gas heating and hot water appliances when old ones need replacing would also prevent locking in unnecessary and easily avoidable emissions. Mainstream media and some politicians talk about the billions of dollars fossil fuel companies ‘invest in Australia’ but SA could easily ban NEW fossil fuel projects in SA without upsetting anyone other than fossil fuel shareholders. The lights would stay on, the wheels of industry would continue to turn, and we’d miss out on surprisingly little in royalties. Many fossil fuel companies don’t even pay income tax: 39 fossil fuel companies with a combined income of $71.9 billion paid no income tax in 2015-16. New fossil fuel projects might create new jobs, but so do new renewable energy and other climate-safe projects, and bans on NEW projects would not affect workers at existing projects. It seems state MPs continue to approve new fossil fuel projects just out of habit without stopping to question whether they still benefit SA. The School Strikers on the steps of Parliament House on November 30 were calling for a ban on new fossil fuels to protect their future. The SA government could easily step up as climate heroes and ban new fossil fuel projects in SA to protect us all. According to Fossil Energy Production charts published by Aneroid Energy.